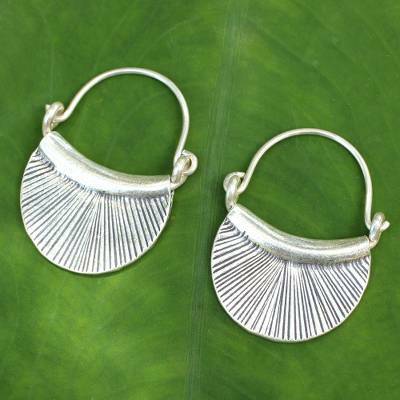 From Wadarat Supasirisuk, these earrings adapt Karen hill tribe silver techniques to modern fashion. The textured hoops evoke stylized fans. These are my favorite earrings. When I lose one from my first pair, I had to order another pair! They are simple beautiful and very comfortable. I love these earrings. They are absolutely gorgeous and I wear them all the time. I bought them several years ago and they still look brand new - they are EXCELLENT quality. Just beautiful. I had my eye on these earrings for a while and finally decided I needed them for myself....I couldn't be happier with my decision! The earrings are well crafted and lightweight enough for all day wear. I also loved the pouch and handwritten note that came with them, these are already going to be a staple in my wardrobe! They are more beautiful than I expected. I bought two pair and I am saving one for a birthday gift for a dear friend. They will be worn for many years to come. "Nice, but did not work for me." These earrings did not work for me because the wires were too thick for the holes in my ears. Also, they were difficult to even get started to put on. On a positive note, the design is very artistic and stunning. Tarnish easily. Difficult to hook. These earrings are weighty, hand finished and very beautiful. I really was pleased when I opened the package. The silver has a brushed appearance and a lined decoration is hand stamped. The wire is a sturdy size. I’ll enjoy these for a very long time! Thanks a million for great earrings! Beautiful, versatile earrings that can be worn with everything. Solid construction, plenty of silver.